All expanded clay is not the same. Hydro Crunch Expanded Clay Pebbles are made with only the highest quality clay, producing a media that is uniform, stable and low in inherent E.C, meaning you get the best outcomes from your plants. Our clays are the next generation in the media you have come to know and love. The ceramic shell and inner pore structure retains moisture and releases it back to your plant's roots as needed. Grow rocks will not compact, ensuring excellent aeration for the life of your plant. it is reusable and lasts indefinitely, making it a great value. 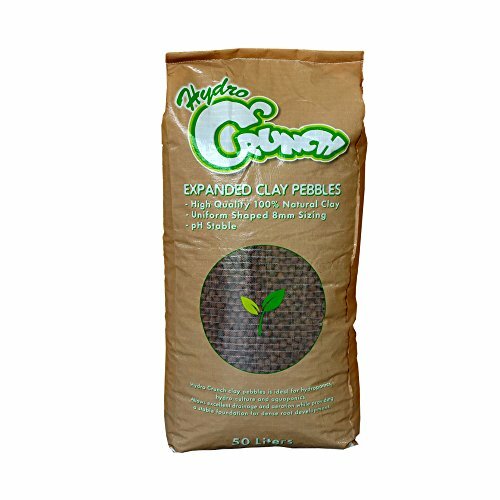 Hydro Crunch Horticultural Clay Pebbles are made from 100% natural clay. They are clean, pH stable and offer great aeration and drainage in hydroponics, especially in flood and drain, deep water culture and drip feed systems. Due to their unique structure and ability to cover a large surface area, they offer the ideal environment to foster beneficial bacterial growth around the root zone, leading to naturally healthier plants. View More In Indoor Gardening & Hydroponics. If you have any questions about this product by Hydro Crunch, contact us by completing and submitting the form below. If you are looking for a specif part number, please include it with your message.